Monday to Saturday: From 12 p.m. to 06 p.m.
Sunday: From 10 p.m. to 04:30 p.m. Please note that the opening hours may vary on public holidays. No additional Fees charged on purchases made by telephone or on-line. Taxes and service fees are included in the price. Student and senior discounts are available with valid I.D. You may purchase tickets at all times, at no extra charge, here. Latecomers: Out of respect for the artists and audience, latecomers or those who leave during the performance will be shown to the nearest seat at the appropriate moment. Note: Tickets may not be exchanged, refunded or resold. They will be cancelled if declared lost or stolen, or if previously used. Cancellations: Refunds for tickets may be obtained in person at the Théâtre Outremont box office. On the evening of the performance, you are advised to arrive 30 minutes ahead of time to purchase or pick up your tickets. 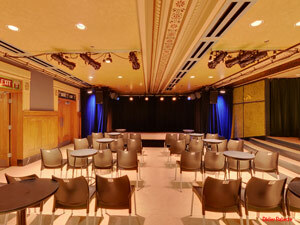 The Théâtre Outremont is equipped with an audio system for hearing-impaired spectators. Those wishing to use this system must bring their own digital receivers and tune them to the 88.1 MHz frequency. Theatre Outremont is now offering you to buy gift certificate at our box office, in person, at your price. The value of the gift certificate is non-refundable. This certificate cannot be surrendered for cash. It might be exchangend only at the box office of the Theatre Outremont.